'']] Cuauhtémoc, [[Chihuahua (Mexico)|Chihuahua State]], [[Mexico|Mexico]], is a town located 120 km (75 mi.) west of the city of Chihuahua (coordinates: <span title="Latitude">28° 24′ 18″ N</span>, <span title="Longitude">106° 24′ 0″ W) </span>in the state of Chihuahua, Mexico. The population in 1953 was just under 3,000, composed almost entirely of Mexicans with the exception of foreign-born people who have come there as traders. The town of Cuauhtémoc developed after the coming of the Mennonites in the 1920's although very few Mennonites lived in town, for it was the Mennonite shopping center. A railroad, a highway, and a bus line connected Cuauhtémoc with Chihuahua. Fretz, J. Winfield and Helen Ens. "Cuauhtémoc (Chihuahua State, Mexico)." Global Anabaptist Mennonite Encyclopedia Online. August 2008. Web. 25 Apr 2019. http://gameo.org/index.php?title=Cuauht%C3%A9moc_(Chihuahua_State,_Mexico)&oldid=86978. Fretz, J. Winfield and Helen Ens. (August 2008). Cuauhtémoc (Chihuahua State, Mexico). Global Anabaptist Mennonite Encyclopedia Online. 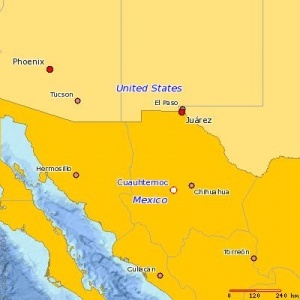 Retrieved 25 April 2019, from http://gameo.org/index.php?title=Cuauht%C3%A9moc_(Chihuahua_State,_Mexico)&oldid=86978.